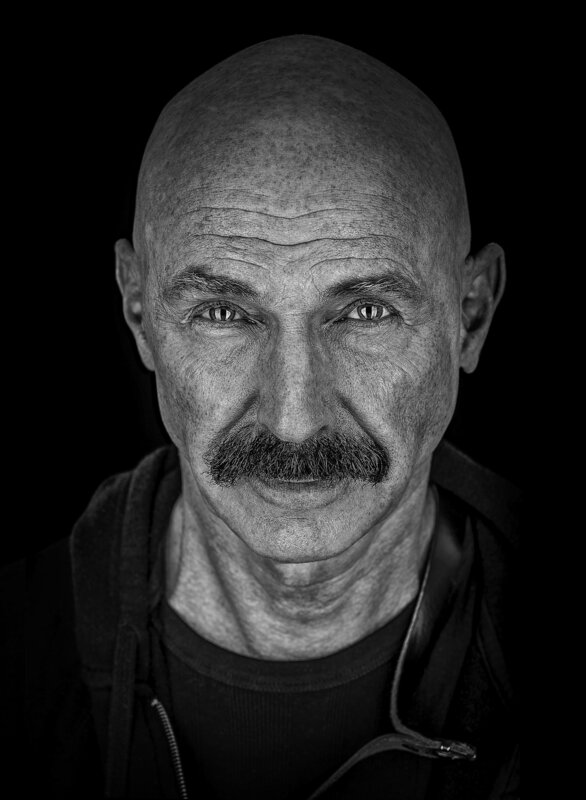 Legendary Bass player Tony Levin recently visited ESO’s telescopes at Paranal and ALMA as part of a visitor group which included Steven Rothery from Marillion, Rick Armstrong and comedian Russell Peters. Together with Rick and Steven, the group played a few songs on Paranal and ALMA for the local staff before being shown around the respective sites. Tony, a keen photographer, decided to use the occasion to take some pictures of the incredible landscapes the and of course, the southern sky at night which he then turned in to this stunning piece of music and video. "Seeing the stars and the arrays at the ESO sites in Chile was so inspiring to me, I was moved to write music to accompany my pictures. Then, wanting to share it all, I fashioned a video of the still shots, and finished writing the music that began to run though my head as I watched the heavens. An incomparable experience. ", said Tony. 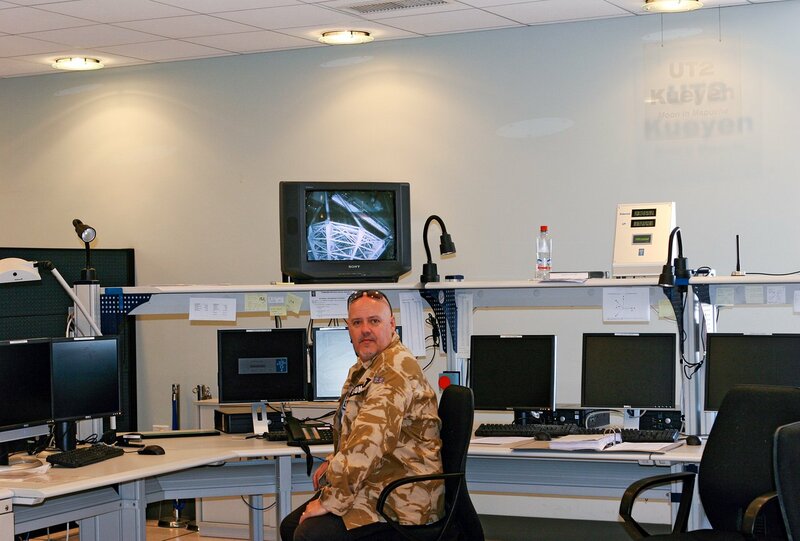 British guitarist, singer, and songwriter, David Gilmour, visited the ALMA Operations Support Facility on 28 December 2017. Gilmour is best known for his involvement in the rock band Pink Floyd, which achieved international acclaim with their progressive music, and even took a foray into space rock with the songs "Astronomy Domine" and "Interstellar Overdrive". Gilmour is an avid supporter and promoter of international charities, and in 2005 was made a Commander of the Order of the British Empire (CBE) for his services to music. Together with his family, Gilmour visited the ALMA (Atacama Large Millimeter/submillimeter Array) antennas in the Chilean Andes. Composed of 66 antennas, ALMA studies light from some of the coldest objects in the Universe and is the most powerful astronomical observatory of its kind. On 15 December 2017, ESO Representative Fernando Comeron welcomed Dutch theoretical physicist Gerard 't Hooft to ESO's Paranal Observatory. A professor at Utrecht University, the Netherlands, 't Hooft is well-known for his contributions to the development of gauge theories in particles physics, and in 1999 he shared the Nobel Prize in Physics with his thesis advisor, for "elucidating the quantum structure of electroweak interactions". 't Hooft also studied quantum gravity and black holes, and he has interesting views on the fundamental aspects of quantum mechanics. 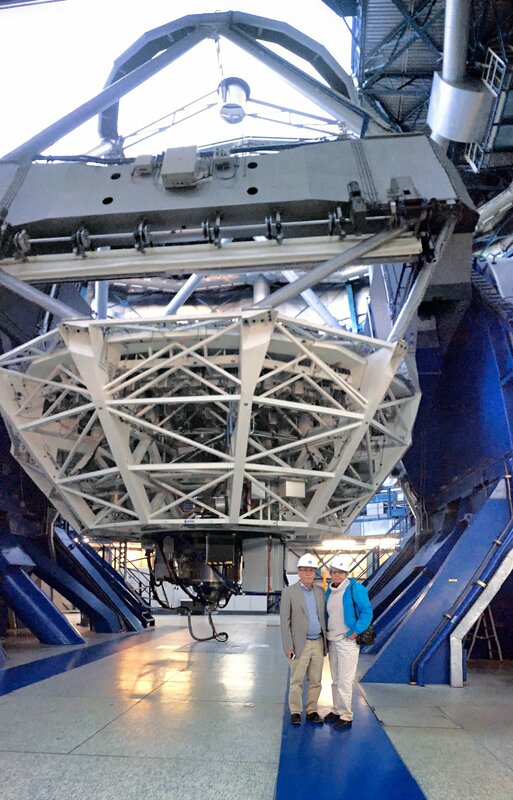 Together with his wife, Albertha Schik, 't Hooft visited Kueyen, one of the Unit Telescopes of ESO's Very Large Telescope (VLT). 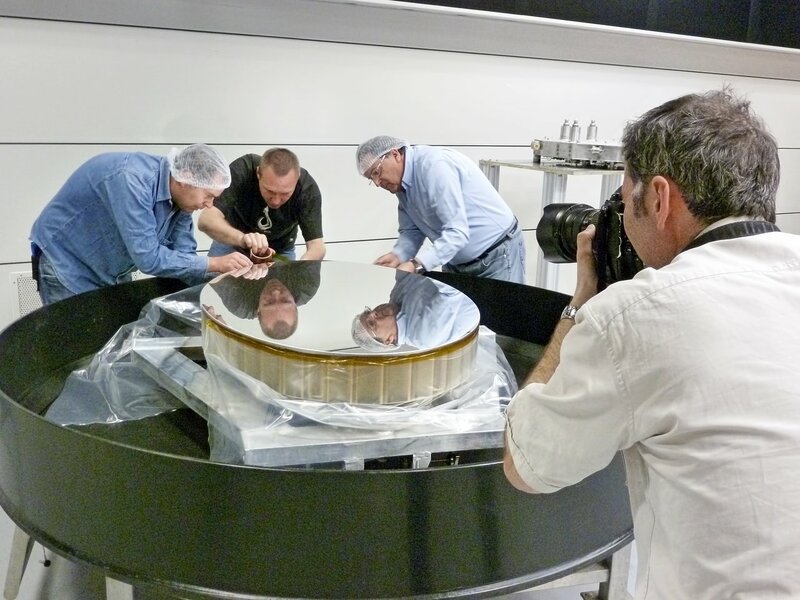 The VLT consists of four Unit Telescopes with main mirrors measuring 8.2 metres in diameter and four movable 1.8-metre diameter Auxiliary Telescopes. The telescopes can work together to form a giant interferometer. The four Unit Telescopes are named Antu, Kueyen, Melipal and Yepun – indigenous Mapuche language words for four meaningful objects in the sky. Antu is "The Sun", Kueyen is "The Moon", Melipal is "The Southern Cross" and Yepun is "Venus". 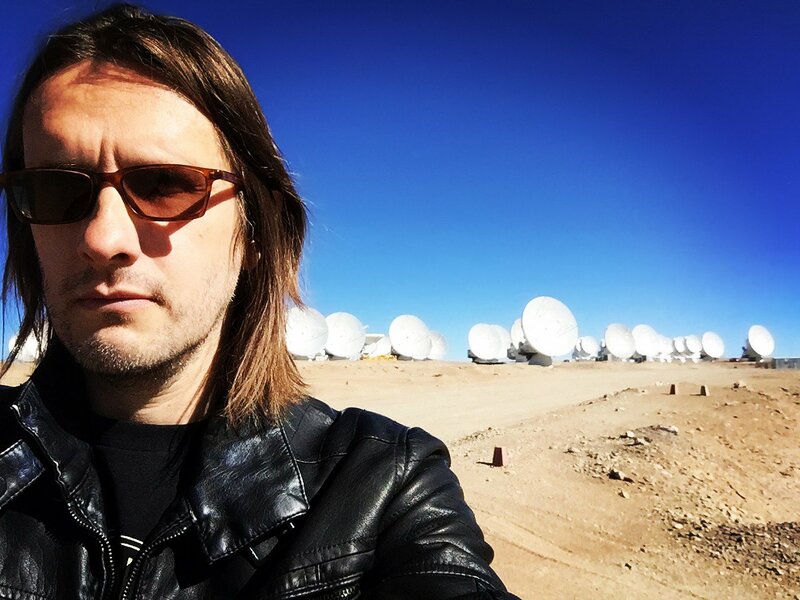 Steven Wilson, British musician and record producer, visited the Paranal and ALMA Observatories to shoot video footage for a song from his forthcoming album “To the Bone”. At ESO’s Paranal Observatory, he was received by the ESO astronomer, Fernando Selman, and ESO Communications Specialist, Simon Lowery. As they showed the artist the premises, they explained the work carried out there and the astronomical advantages of being located at such dry, high-altitudes. Wilson was joined by the photographer and film producer Lasse Hoile. Together, they filmed in and around ALMA, Paranal, and other locations across the Atacama desert. 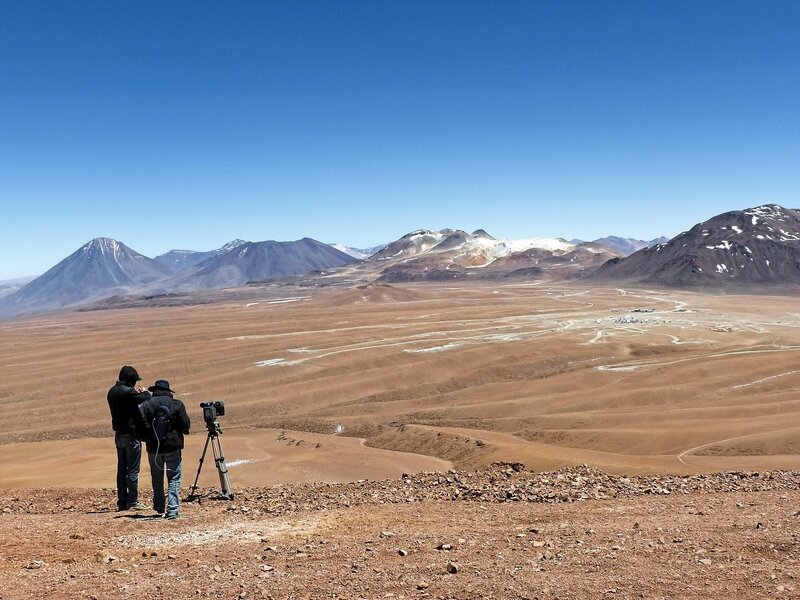 The musician also visited Cerro Armazones in time to see the levelled mountaintop before construction begins on ESO’s forthcoming Extremely Large Telescope. Wilson was impressed, not only by the locations he visited but also the warm and friendly reception he received from the ESO and ALMA staff. The new album is set for release in August, followed by the video, which will include footage of ESO/ALMA sites. Quadrature, the winners of the 2015 art&science@ESO Residency Award paid a visit to ESO headquarters in Garching on the 4 July 2016. A group of artists now based in Berlin, the team consists of Jan Bernstein, Sebastian Neitsch and Juliane Götz. Together they describe themselves as “an atelier for arts, robotics and light”. The award is the result of the ongoing cooperation between ESO and Ars Electronica. Quadrature were selected from a highly competitive pool of 322 entrants from 55 countries who responded to the 2015 Open Call. 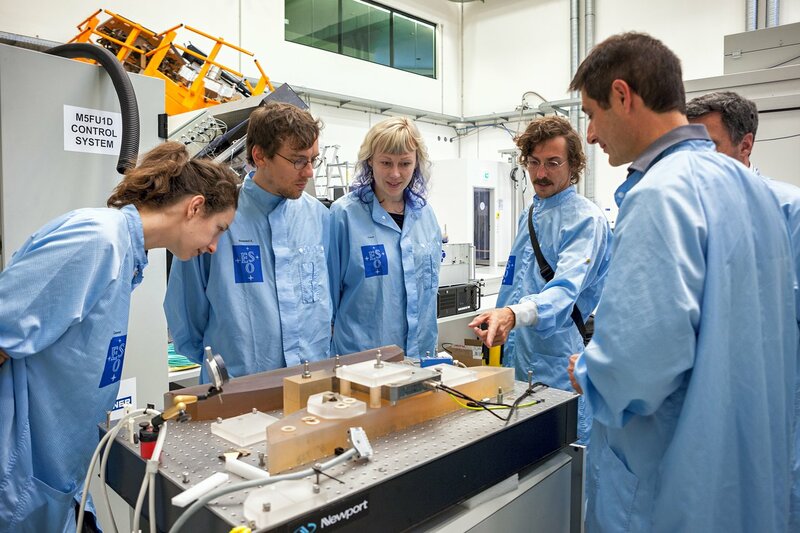 For their prize, they will take up a residency at one of ESO’s observatories in Chile, followed by a month at the Ars Electronica Futurelab in Linz, Austria where they will develop and create new work inspired by the visit to ESO. 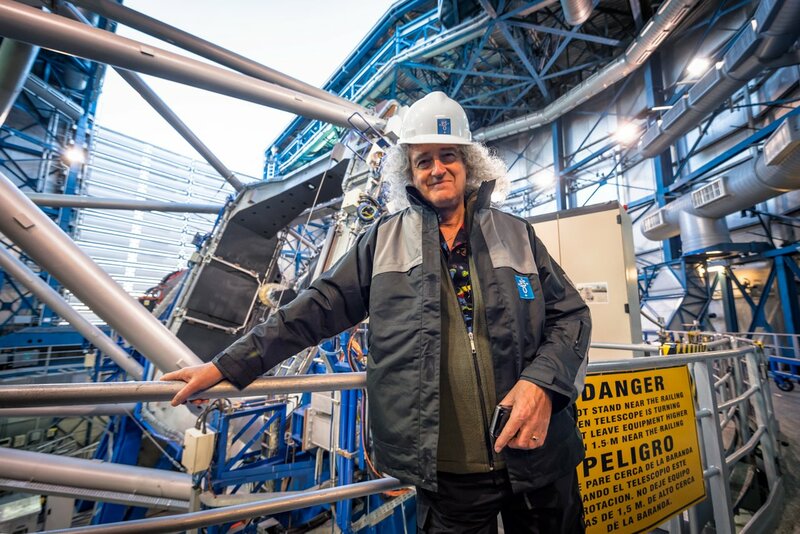 On 28 and 29 September 2015, ESO’s Paranal Observatory welcomed a very special visitor — British rock guitarist, singer, songwriter and astrophysicist, Brian May. Unbeknownst to many, Brian May — famed for being the lead guitarist of the legendary rock band Queen — has a passion for astronomy. In addition to holding a PhD in astrophysics, the guitarist is a science team collaborator for NASA's New Horizons mission, which flew past Pluto in July 2015. ESO therefore decided to invite Brian May to come to Paranal while he was in Santiago, Chile, as part of his current South American Queen tour with Queen drummer Roger Taylor and American singer Adam Lambert. ESO’s Paranal Observatory is located 130 kilometres south of Antofagasta, in the arid Chilean Atacama Desert. It is home to the four 8.2-metre Unit Telescopes and four 1.8-metre Auxiliary Telescopes of ESO’s Very Large Telescope. Paranal is one of the best sites for observational astronomy in the world. Touring the facilities, May visited the telescopes at the summit of Cerro Paranal and spent the night at Paranal’s award-winning Residencia, which houses the staff working on site at the observatory. The guitarist was welcomed in the observatory control room by the observing teams as an honorary visiting astronomer; and Monday evening’s activities included securing images of the asteroid named after him, the planet Pluto, and the celebrated Pillars of Creation (These observations did not affect the normal science operations of the telescopes. They were made at a time when poor seeing and full Moon meant that no other observations could be scheduled.). May studied for his PhD degree at Imperial College London. His doctoral thesis (spanning 30 years!) focused on properties of the zodiacal light, a misty diffuse cone of light scattered by dust in the Solar System that appears in western skies after sunset and in eastern skies before sunrise. On a dark and clear night, Paranal is one of the best places on Earth to see this elusive feature of the sky, and, indeed, in a small window between sunset and moonrise last night, the evening Zodiacal Cone was seen and photographed by the team at Paranal. 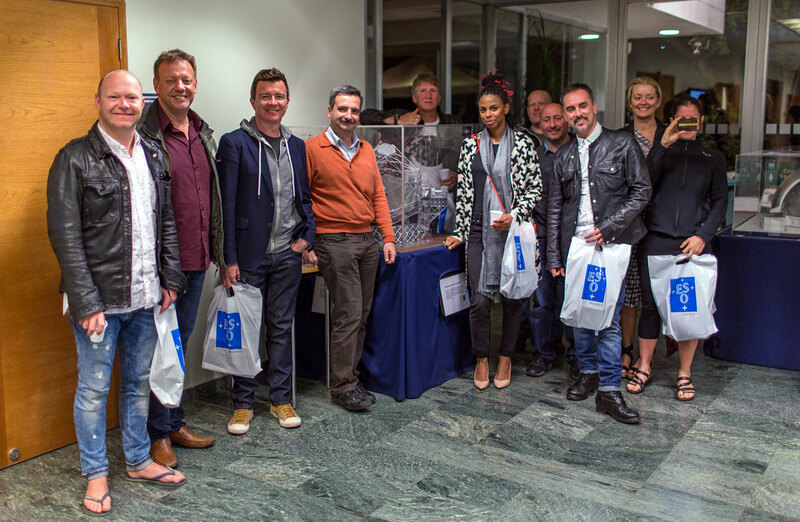 Rick Astley, the British pop singer and songwriter, visited the ESO offices at Vitacura in Santiago de Chile, on 7 April 2014. Astley — who sold more than 40 million records worldwide during the eighties and nineties — not only gave two sold-out concerts in Santiago, but he also took the time to learn more about the ESO observatories in Chile and the science achievements of the Very Large Telescope, ESO’s flagship at Cerro Paranal. At ESO’s Santiago office, he was received by the ESO representative Fernando Comerón, ESO Communications engineer Simon Lowery and astronomers Amy Tyndall and Olivier Hainaut. They showed him the premises and explained the work of the Santiago centre, such as logistics for observatory operations in the north of Chile and data analysis carried out by the astronomers when they are not on duty at the observatories. Astley was accompanied by his wife and members of his band. After the tour Astley expressed a wish to visit the Paranal Observatory, in the north of Chile. As part ESO’s 50th Anniversary in Chile events, the former European Space Agency astronaut and veteran of four space flights, Claude Nicollier, visited ESO’s Paranal Observatory in northern Chile on 3-4 December. The Swiss astronaut had the chance to visit one of the Unit Telescopes of the Very Large Telescope and also watch the amazing sunset from the telescope platform. After dinner, he visited the control room where every night the astronomers study at the clear skies of the Atacama desert. This is not the first experience of Nicollier with state-of-art telescopes. In 1993, during his second spaceflight, he was part of the crew of the first NASA/ESA Hubble Space Telescope servicing and repair mission. Hubble was captured and restored to full capacity through a record of five spacewalks by four astronauts. Six years later, he was also on an 8-day mission where he and the crew of the Discovery space shuttle made another visitor to Hubble to install upgrades. On 17 December 2012, after an impressive string of performances held at Munich’s Olympiahalle from the 14–16 December, eight of the performers and crew from AIDA Night of the Proms 2012 visited ESO’s Headquarters in Garching, Germany. This included the German band Jupiter Jones and the Electric Band (Percussion/Patrick De Smet, Drums/Hans Van den Hurk, Guitar/Arnold Van Dongen, Keyboard/Geert Keysers). 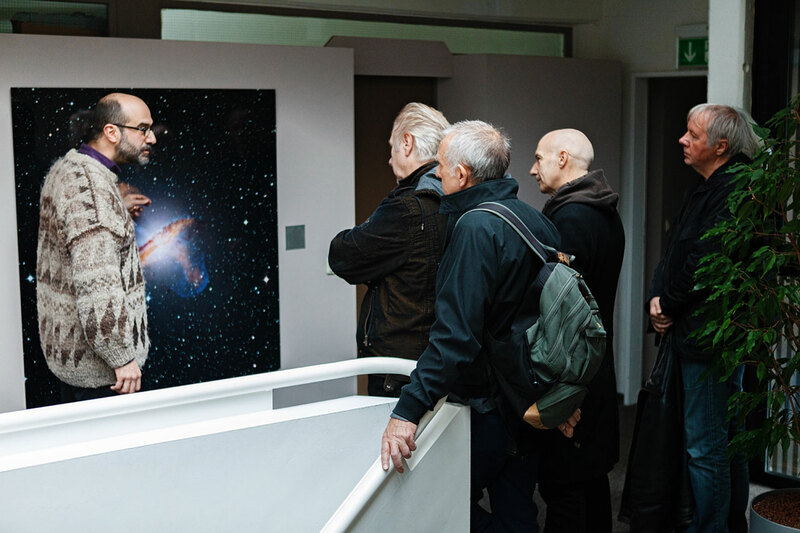 They were given a guided tour of the facilities and admired many of the stunning astronomical images on show throughout the building, before learning more about ESO’s astronomical work and observatories from astronomer Olivier Hainaut. 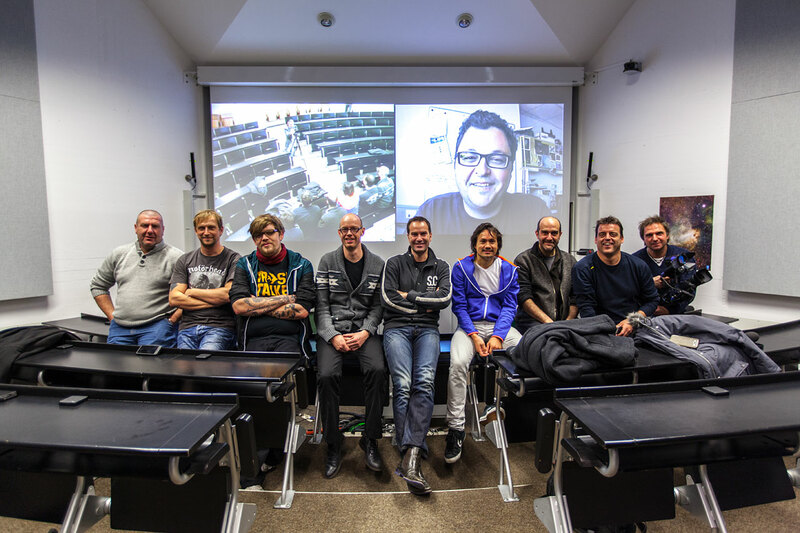 A live video connection to ESO’s Paranal Observatory in Chile was also held so that the visitors could speak to an astronomer living and working at Paranal, the site of the Very Large Telescope (VLT) — the world’s most advanced visible-light astronomical observatory. The AIDA Night of the Proms 2012 concerts are held yearly throughout Europe, and showcase a mix of pop and classical music. Performers from this year’s concerts included Mick Hucknall from Simply Red, Anastacia, Jupiter Jones and Naturally 7. British New Wave rock band Ultravox were given a guided tour of ESO's Garching Headquarters on 28 October 2012. The band, consisting of Midge Ure (lead singer, guitarist, and frontman), Billy Currie (keyboard player/violinist), Chris Cross (bass) and Warren Cann (drums) are mid-way through a European tour to promote their new album "Brilliant". During their visit, the band admired some of the spectacular astronomical images that adorn the walls of ESO's headquarters while learning more about the observatory and its facilities from astronomer Olivier Hainaut. Through a live video connection to the Very Large Telescope in Paranal, Chile, the band got a chance to speak to another ESO astronomer, Julien Girard, about living and working at Paranal. The band thoroughly enjoyed this brief diversion into the amazing world of astronomy, before returning to their busy European tour! The bands reaction was "We thought we were technically advanced, but this is another league. All that is going on in the Universe makes us feel small!..." 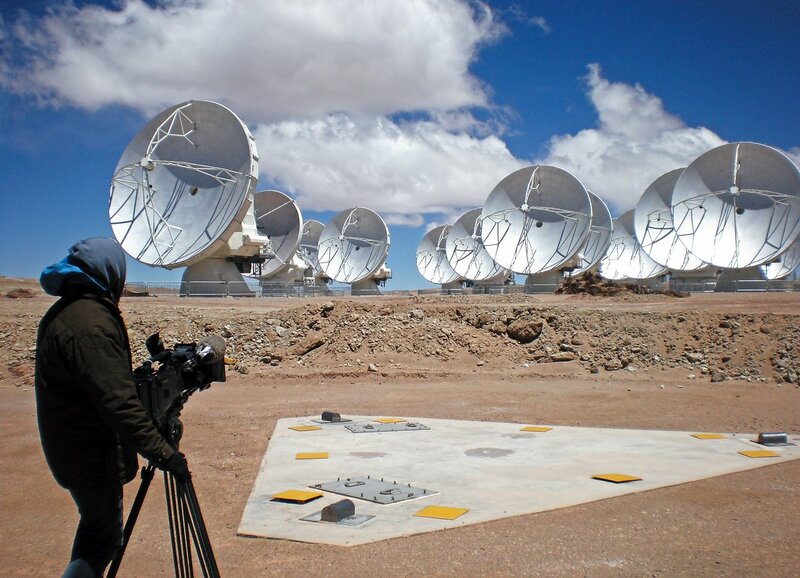 A crew from the Dutch public broadcaster VPRO and the Dutch Research School for Astronomy (NOVA) visited the Atacama Large Millimeter/submillimeter Array (ALMA) observatory from 1–6 September 2012. The purpose of this visit was to film for an episode of the Dutch television science programme “Labyrint”. This episode, titled “Stargazing in the Andes”, is entirely dedicated to ALMA and the impact that its observations will have on our knowledge of the Universe and its origins. With an audience of 200 000–300 000 viewers, Labyrint is a weekly 25-minute documentary style television programme focused on scientific developments and discoveries, and their relationship with everyday society. To mark ESO’s 50th Anniversary, the programme was broadcast on 3 October 2012 at 20:50 CEST, on the Nederland 2 channel. The programme is also available online. ALMA is a partnership of Europe, North America and East Asia in cooperation with the Republic of Chile. ESO is the European partner in ALMA. 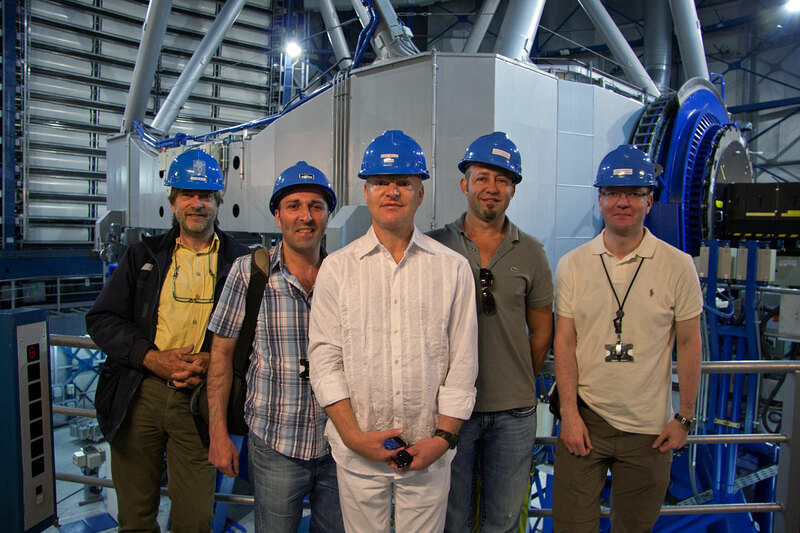 Andy Bell, lead singer of the famous British synthpop band Erasure, visited Paranal Observatory in February. Andy spent one day onsite, during which time footage was shot of him singing Erasure’s latest single. The footage was then edited with some of ESO’s best astronomical images. Andy, thrilled with the result, decided to dedicate the video to ESO’s 50th Anniversary and make it the exclusive video for the single. Following his visit, Erasure released the video for their latest single — Fill Us with Fire (ESO 50th Anniversary Exclusive), as a tribute to ESO’s 50th Anniversary. The video, which was improvised on the spur of the moment during an informal visit, features the Very Large Telescope as well as some of ESO’s stunning images of the night sky. This is the third single to be released from their 2011 album Tomorrow’s World. The award-winning editorial and commercial photographer Max Alexander is currently visiting ESO’s sites in Chile, portraying ESO’s staff as part of a collaboration for ESO’s 50th Anniversary. Max is now at the Paranal Observatory, home of the Very Large Telescope. Focusing on the human story behind Paranal’s scientific success, Max is portraying a very diverse pool of staff members — from engineers to cooks, from drivers to scientists, capturing their daily working environment, both indoors and outdoors. Through this endeavour, Max aims at giving a sense of the daily life and activities of the Paranal hub, such as observing runs, daytime engineering, life in the Residencia, and giving a sense of the scale and context in which staff work, high in the Atacama Desert. Before Paranal, Max was on the Chajnantor Plateau in the Chilean Andes, where ESO, together with its international partners, is building ALMA — a state-of-the-art telescope to study light from some of the coldest objects in the Universe. Max’s work will be featured in ESO’s Anniversary coffee-table book and DVD, two products which showcase ESO’s 50 years of reaching new heights in astronomy. The book and the DVD will be released to coincide with the anniversary date itself on 5 October 2012. The Welsh company Green Bay Media is producing a six-part TV series on life in deserts around the world, including northern Chile. The programme follows on from earlier series about rivers and islands. A production team from Green Bay spent three days at ESO´s Paranal Observatory, following the life and work of an astronomer, from 5 to 7 December 2011. The story will be included in the chapter dedicated to the Atacama Desert. The TV series is still in production, with expected worldwide broadcasting in 2012 by National Geographic Television, the Welsh broadcaster S4C and French television. 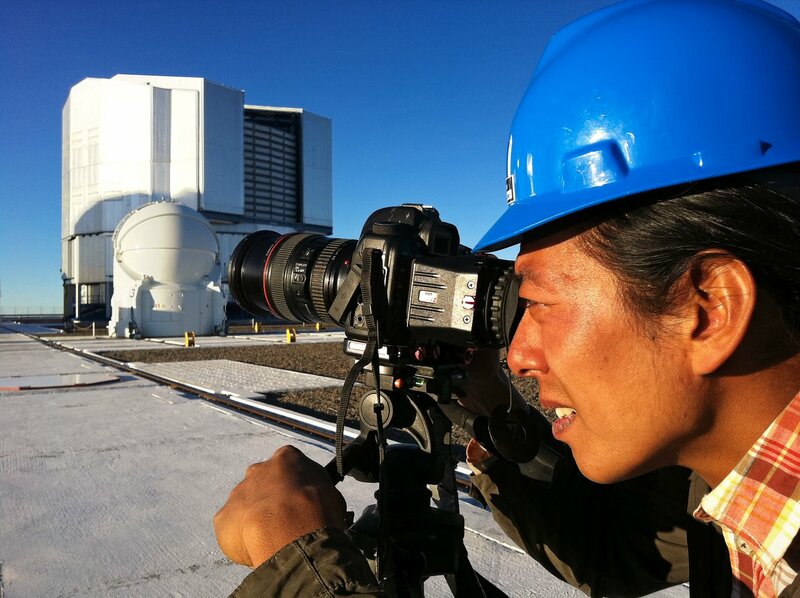 The producer and host of the Chinese TV travel series All the Way South spent a night at ESO’s Paranal Observatory on 5 December 2011. All the Way South is a 20-episode series about crossing both Americas from Barrow, Alaska to Ushuaia, Argentina, which is to be split and shown as two mini-series, each of ten episodes, focusing on the local people and fascinating topical stories little known to the Chinese audience. It is aired by Travel Channel China, a nationwide TV network for travel, fashion and lifestyle, currently covering all provinces in China with an audience reach of 350 million. Paranal Observatory will be included as one of the highlights discovered by Kyle G. Johnson (谷岳), host of the TV series, on his journey . 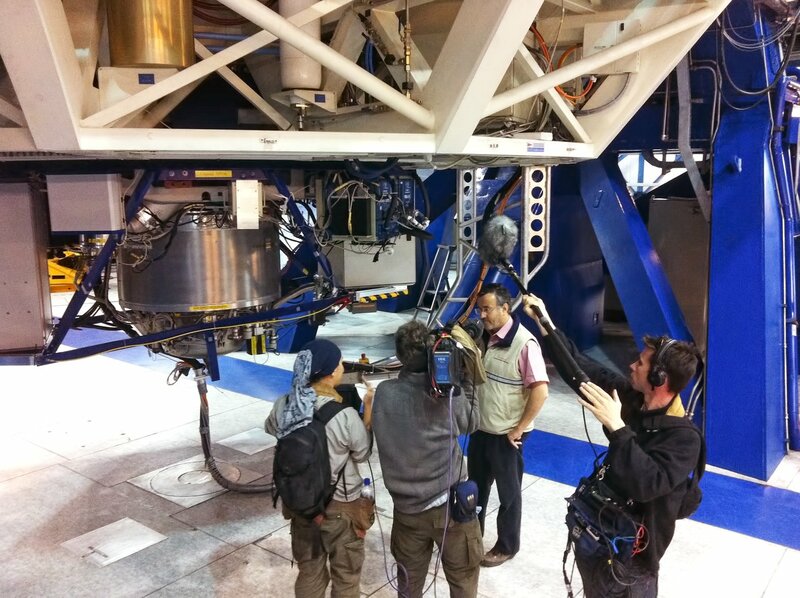 A professional film crew from Marco Polo Film AG visited the ALMA site from 21 November to 2 December. Marco Polo Film AG is a production house, based in Germany and specialising in high definition formats and high quality products. They are currently developing a feature documentary on ALMA for the international market. 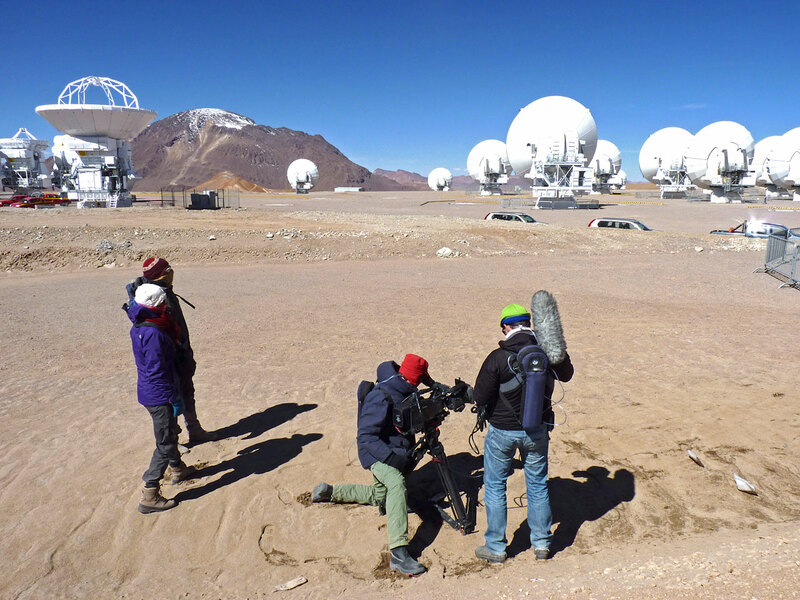 A professional crew from an Austrian satellite/cable channel, Servus TV, spent five days at the ALMA site, from 10-14 October, shooting material for the eighth episode of Mission Universum. Mission Universum is a German-language TV series about astronomy, running since January 2011 and broadcast on Servus TV, which is available in a number of countries, including Germany, Italy and Switzerland. The well-known ESOcast and Hubblecast host, Dr J, aka Dr Joe Liske, also hosts this TV series. Pavel Fadeev, the 19-year-old student from Israel who won the special ESO prize at the 22nd European Union Contest for Young Scientists (EUCYS), enjoyed the trip of a lifetime to ESO’s sites in Chile from 10–15 October 2011. The trip included an overnight stay at Paranal Observatory and a visit to Cerro Armazones, the home of the future E-ELT. In his winning project, Pavel reclassified 270 extragalactic star-forming regions from the Sloan Digitized Sky Survey (SDSS) database and made a comparative study of their physical properties versus those of similar objects located in our own galaxy, the Milky Way. EUCYS is the most prestigious European scientific contest for students aged between 14 and 21. In this 22nd contest, 124 young scientists from 37 countries showed their projects at Lisbon’s Electricity Museum, from 24–29 September 2010. The laser guide star, one of the visually more impressive icons of ESO’s Very Large Telescope (VLT) was the focus of attention for the luxury magazine Conde Nast Traveller when they visited to capture the stunning night sky over the Atacama Desert. On the night of 28 August 2011, photographer Michael Turek captured the striking yellow beam as it stretched 90 kilometres into the night sky, pointing to the centre of the Milky Way, displayed magnificently overhead. 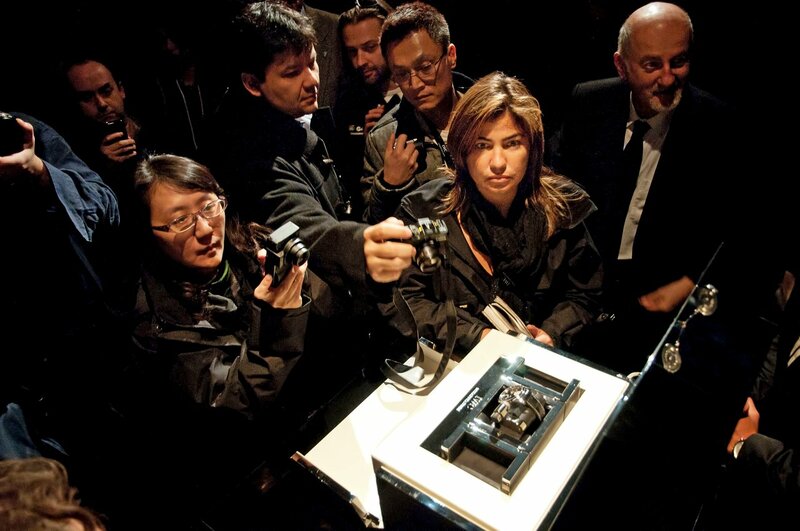 The unique location of ESO’s Paranal Observatory, in the middle of the Atacama Desert in Chile, was the venue chosen by the prestigious Swiss watch manufacturer IWC Schaffhausen to launch the Portuguese Sidérale Scafusian on 27 August 2011. This is a watch that combines solar time with sidereal time, together with other astronomical displays such as a chart of the stars overhead for a given geographical location. Media professionals from all over the world attended the event and experienced the unique ambience as the domes opened at sunset. They also made a nighttime visit to the operations centre of the Very Large Telescope, where the astronomers control the telescopes that make the observations that allow them to explore the Universe. 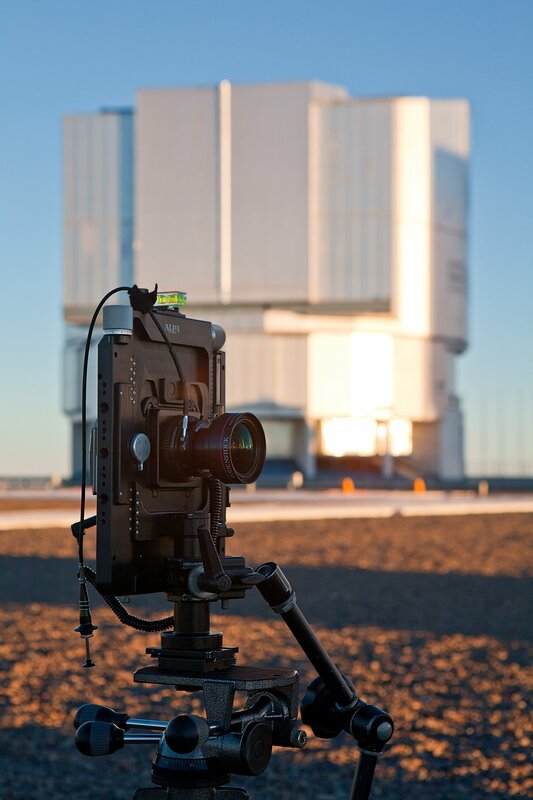 A professional photography crew spent three days, on 12–15 August 2011, at ESO’s Paranal Observatory, taking pictures for a publicity campaign by the British luxury motor brand Land Rover. The site of the VLT was one of the selected locations for this campaign, entitled “Perfect Places”. The Chilean Atacama Desert is, apart from being a perfect place for ground-based optical astronomy, also a magnificent setting for landscape photos. Moreover, the combination of state-of-the art technology, cutting-edge science, a stunning environment and impressive facilities makes ESO’s Paranal Observatory a unique place in the world — a perfect place indeed! 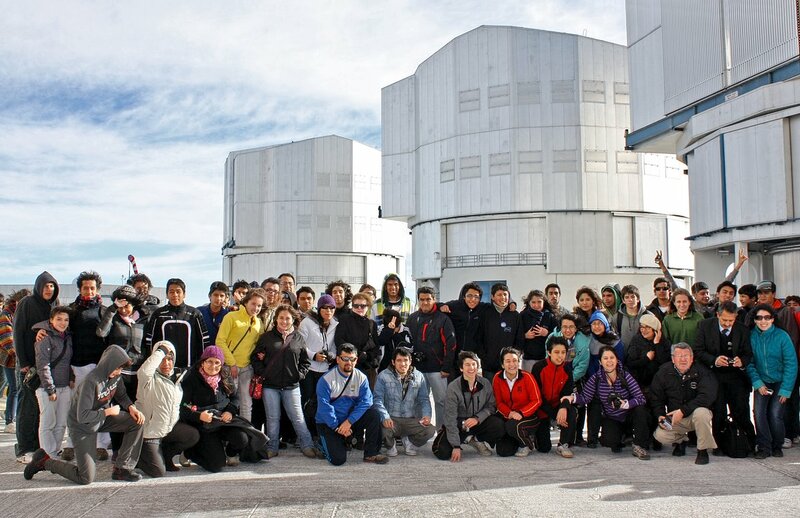 An enthusiastic group of more than 100 Chilean students and teachers travelled along the desert road to visit the Paranal Observatory on 30 July 2011. The activity was part of the III Astronomy and Astronautic National Olympics, organised by the Astronomy Outreach Centre Paranal-UCN and the Chilean Astronomical Society (SOCHIAS), and supported by ESO. The Astronomy Olympics was one of the activities organised in Chile for the International Year of Astronomy 2009. More information about the 2011 event is available here. The visual artist Grace Weir (http://www.graceweir.com/) led a crew that filmed for two nights at ESO’s Paranal Observatory from 25–27 July 2011. Her film In search of perfection will tell the story of an extraordinary expedition to reveal the centre of our galaxy, the Milky Way, aiming to capture a view of something that cannot be seen directly: a black hole. The main character in her film is the astronomer Stefan Gillessen, who was observing the supermassive black hole at the centre of the Milky Way with the Very Large Telescope, during her visit (for more information about his research, see here). 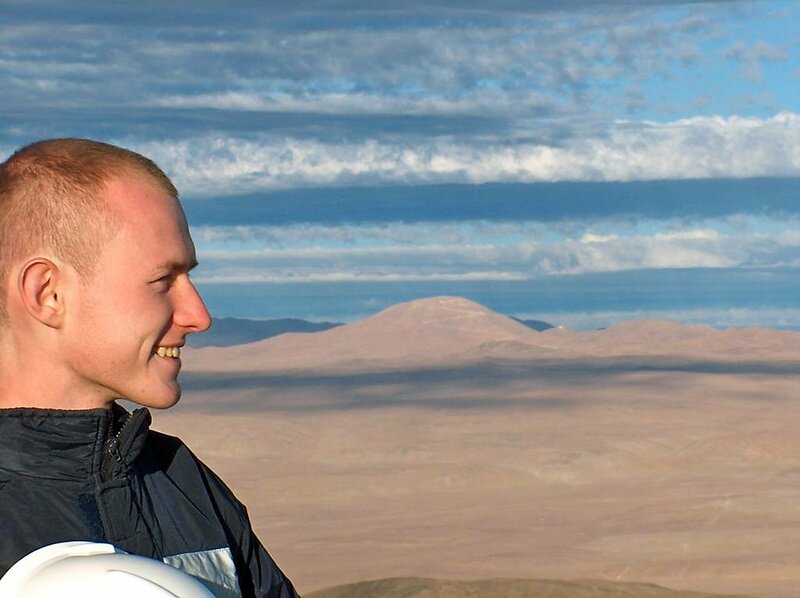 The German photographer Georg Fischer (http://www.georg-fischer.de/) spent three days at Paranal Observatory taking pictures of the Very Large Telescope (VLT) on 19–21 July, 2011. The images will be included in the catalogue and print materials for a new car model to be launched later this year by the automobile manufacturing company BMW. 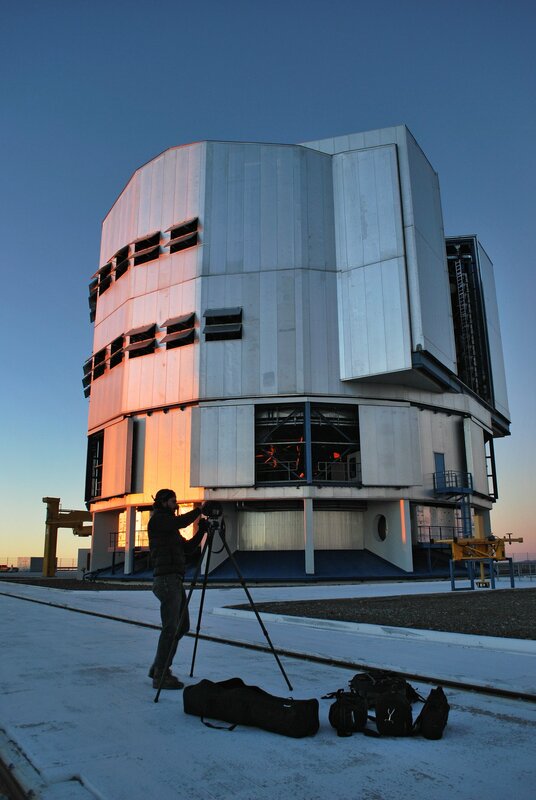 Georg Fischer Studio chose Paranal for this campaign because he was attracted by the unique and visually stunning nature of the VLT’s location. 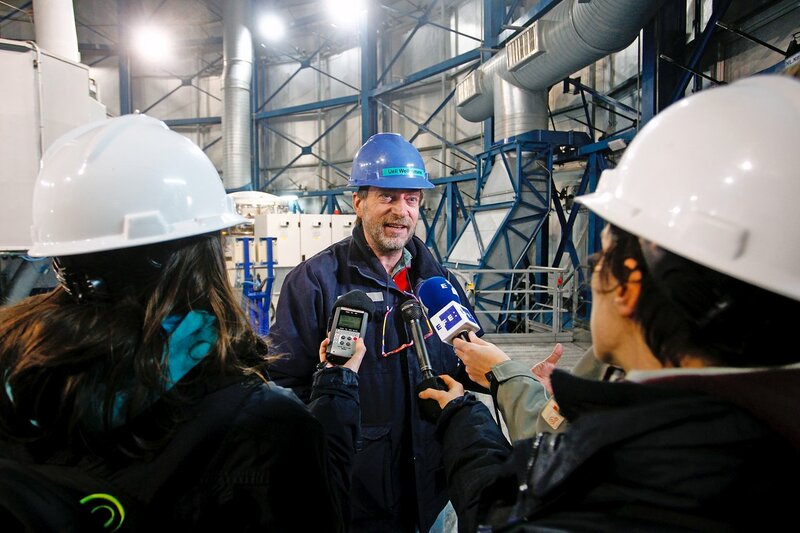 An international group of journalists visited Paranal on 20–21 June, 2011. 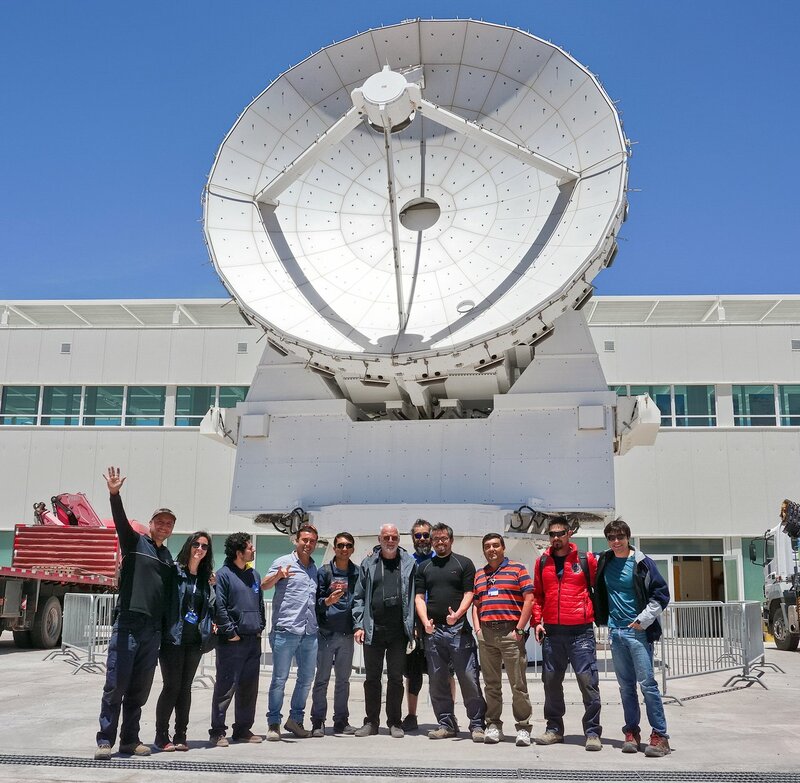 The trip was the kick-off event of a new collaboration established between ESO ePOD and the Association of International Press Correspondents in Chile, to share the wonders of astronomy with millions of readers worldwide. The Chilean-based reporters work for the BBC, the German news agency DPA, Le Figaro and RFI (France), the Spanish news agency EFE and the Chinese news agency Xinhua. They explored the activities behind the scenes at Paranal Observatory, hosted by ESO senior astronomers and engineers. The journalists produced several pieces on ESO and astronomy for global distribution, including a feature story highlighted on the BBC’s homepage, in English and Spanish. 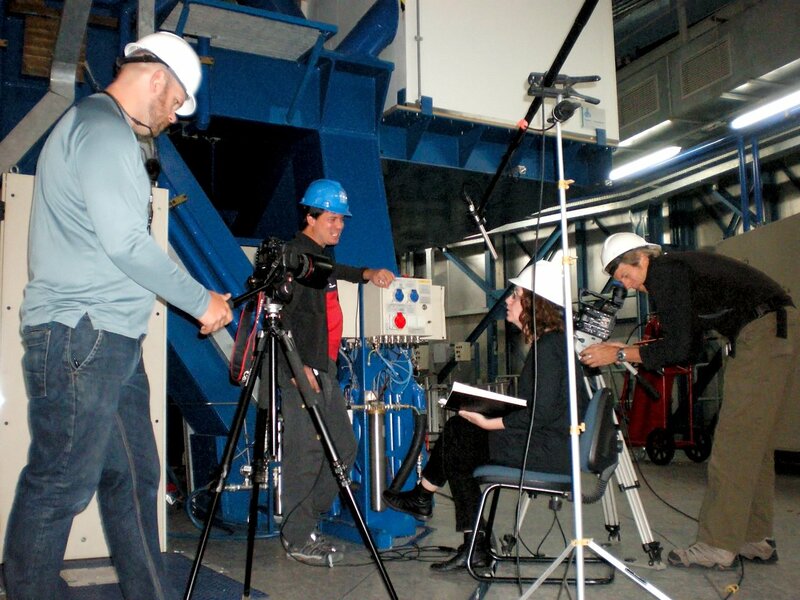 A TV crew producing a documentary for the BBC television programme “Horizon” visited Paranal on 24–27 May, 2011, to learn more about the new frontiers explored with the Very Large Telescope. Horizon is a popular and long-running UK science television series, which has been broadcast since 1964. It is now broadcast on various networks worldwide, including BBC America, and a select number of programmes in each series are co-productions with the Discovery Channel. In UK alone, each episode has around two million viewers. Information about the series is available here. At Paranal, the TV crew followed a team of international astronomers studying the supermassive black hole at the centre of the Milky Way. A delegation of members of the Austrian Ministry of Science and Research as well as representatives of several Austrian scientific institutes visited ESO’s Paranal Observatory on 22 May 2011. The delegation included Barbara Weitgruber, Director General of Scientific Research and International Affairs of the Austrian Ministry of Science and Research; Daniel Weselka, Director of Basic Research and Research Infrastructure, Department of the Austrian Ministry of Science and Research; Sabine Schindler, Director of the Institute for Astrophysics and Particle Physics at the University of Innsbruck; and Heinz Engl, elected Rector of the University of Vienna. 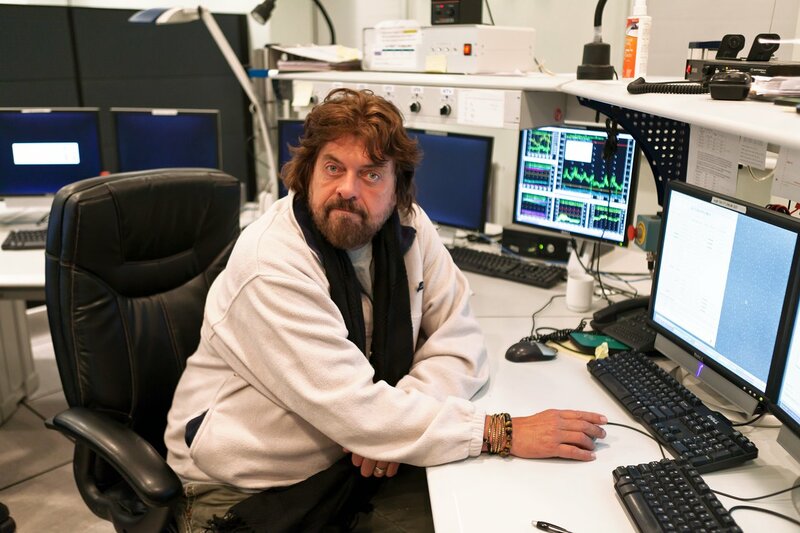 Alan Parsons, a British music producer and musician who became famous after contributing to Pink Floyd’s Dark Side of the Moon as a recording engineer, visited Paranal in May 2011. 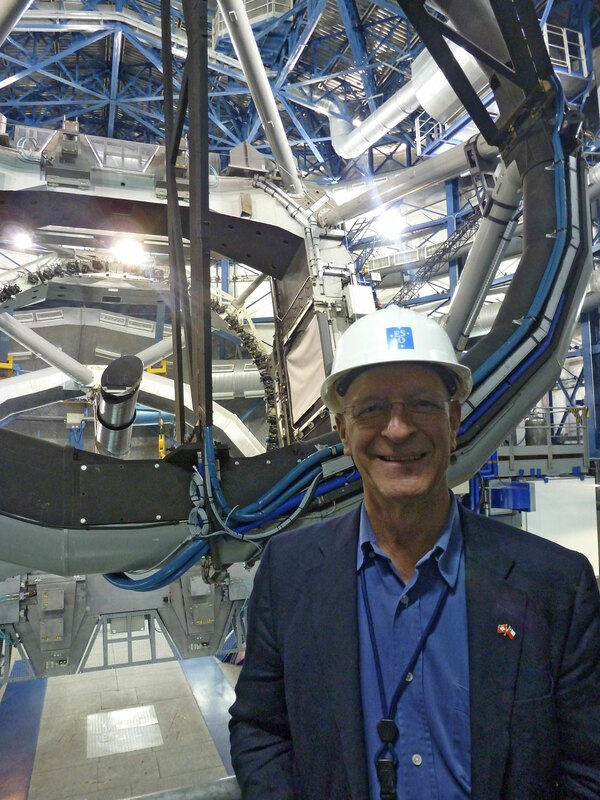 At ESO’s observatory, he had the chance to take a look at the VLT’s control room. The visit followed a sold-out concert of The Alan Parsons Live Project in Santiago. The Atacama Desert, where Paranal is located, is the perfect place to find inspiration for new music ventures. Appropriately, just like the VLT, Alan has an Eye in the Sky — a song which became a worldwide hit in 1982, co-written by Parsons’ musical companion Eric Woolfson, who was also the vocalist of the song. 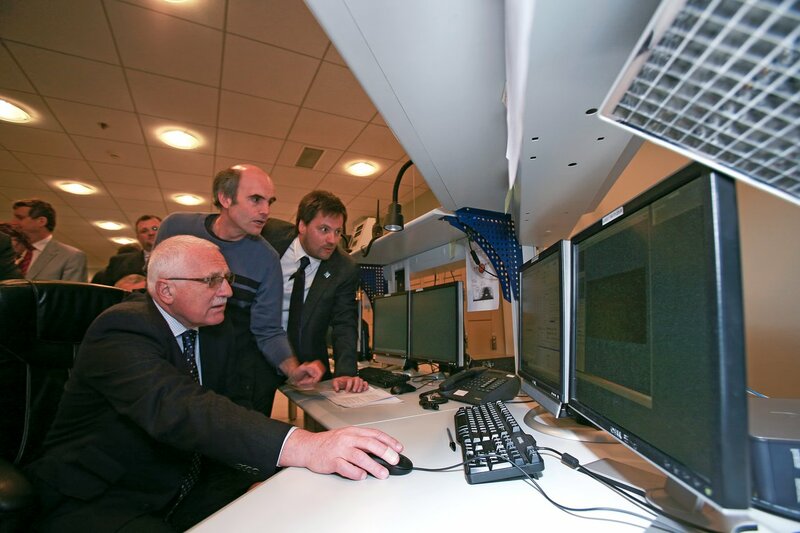 ESO’s Paranal Observatory was honoured with a visit from the President of the Czech Republic, Václav Klaus, and his wife Livia Klausová, on 6 April 2011. 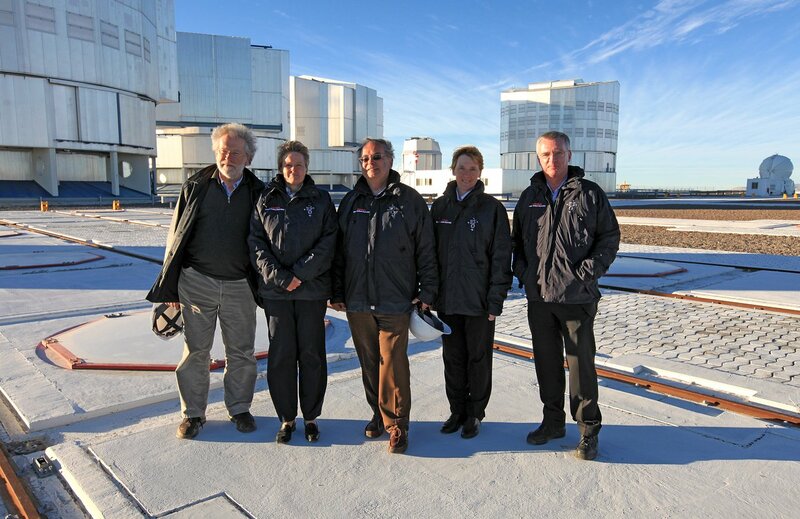 The distinguished visitors were shown the technical installations at the observatory, and were present when the dome of one of the four 8.2-metre Unit Telescopes of ESO’s Very Large Telescope, the world’s most advanced visible-light observatory, opened for a night’s observing at Cerro Paranal. Read more about his visit in press release eso1112. 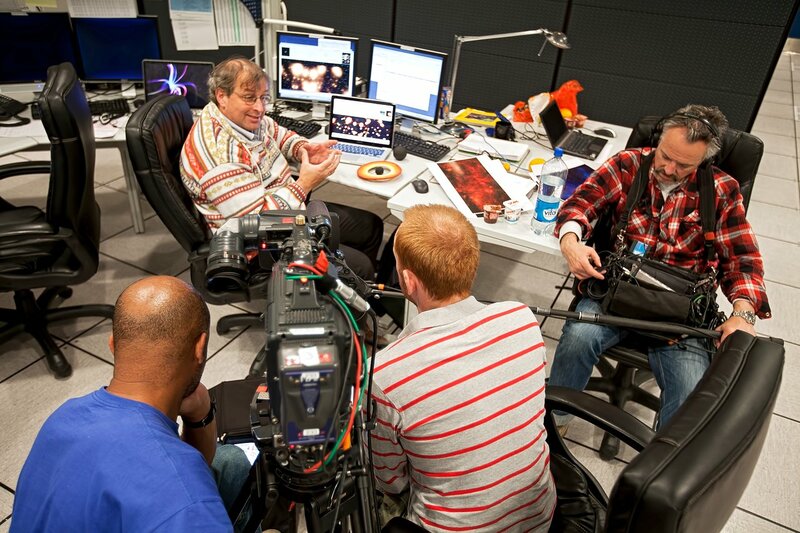 On 20 April 2011, ESO’s Paranal Observatory was visited by the TV programme “Future Now” from Deutsche Welle. They produced an interesting piece on earthquakes and the effort by scientists to understand these destructive phenomena better. As Paranal hosts one of a series of state-of-the-art seismic sensors distributed across northern Chile, the TV crew visited the Very Large Telescope for the ending sequence of their story. After having heard from friends at ESO about the beautiful Chilean site, Ricky Wilde, a British songwriter and musician, decided it was time for him to take a look at Paranal. 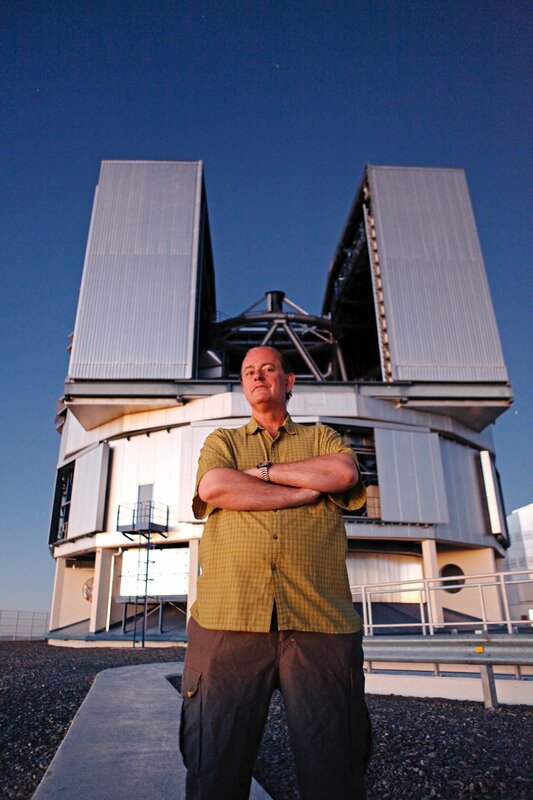 He visited the observatory in February 2009, where he saw how ESO’s telescopes work by touring VLT’s control room. Being a songwriter, he took the opportunity to find inspiration to write new songs for his sister Kim Wilde and his daughter Scarlett Wilde. Ricky released his first single, “I am an astronaut”, at the age of 11 and later made a career as a producer and songwriter. He co-wrote the song “Kids in America”, that made Kim Wilde famous. Scientists and engineers are frequent visitors to ESO’s Paranal observatory. But in February 2010, a famous musician and music producer was seen on the site. Martyn Ware visited the observatory for a day in February 2010 with his daughter Elena, and took the opportunity to pose in front of one of the VLT’s Unit Telescopes. Known as one of the leading figures in British electronic music, having formed The Human League and Heaven 17, Martyn has always been fascinated by science in general, and astronomy in particular. He had wanted to see the home of ESO’s flagship observatory for some time. The opportunity for Martyn to visit Paranal came during a family vacation in San Pedro de Atacama, about 360 km from the ESO observatory.